Alcúdia is also common, with nearly 20,000 inhabitants, belonging to the County of Raiguer. 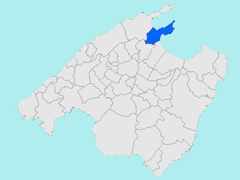 The municipality includes, besides the town of Alcúdia stations Platja d’Alcúdia and Port d’Alcúdia. The fortified town of Alcúdia is the oldest city of the Balearic Islands : it was founded by the Phoenicians, and in Roman times, flourished under the name of Pollentia, which it retains some vestiges. Its present urban structure, with its narrow streets, is of medieval origin; fortifications dating from this period have been restored in the twentieth century. The architecture of the buildings door, she, the mark of the Renaissance in its doors and windows. As a reward for his loyalty during the revolt of the Germanies, King Charles I of Spain of the House of Habsburg, the future Emperor Charles V of the Holy Roman Empire, in Alcúdia granted the title of "Ciutat fidelissima". 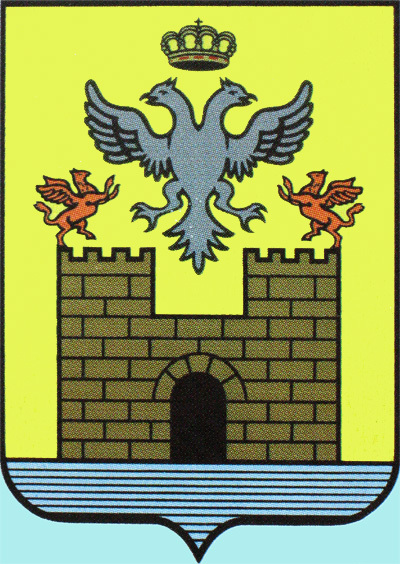 The city retains its weapons in the two-headed eagle of the Habsburgs. 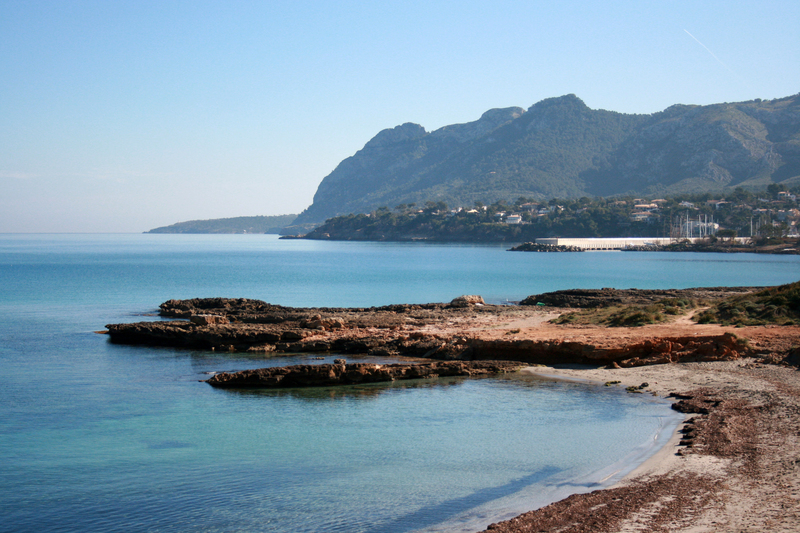 The name Alcúdia comes from the Arabic Al-Qudya, which means "the hill". 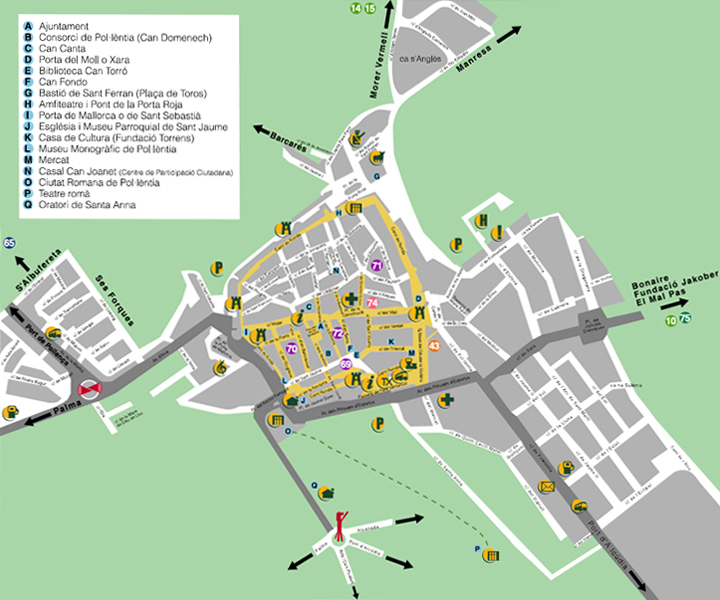 After the Reconquest, King Jaume I renamed the town of Sant Jaume de Guinyent, but the Arabic place name remained in use and became the official name of the city. Al-Qudya was part of "juz" of Bullansa whose name comes from the name of the ancient Roman city of Pollentia. 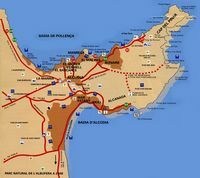 The city name is spelled Alcudia in Castilian Spanish. 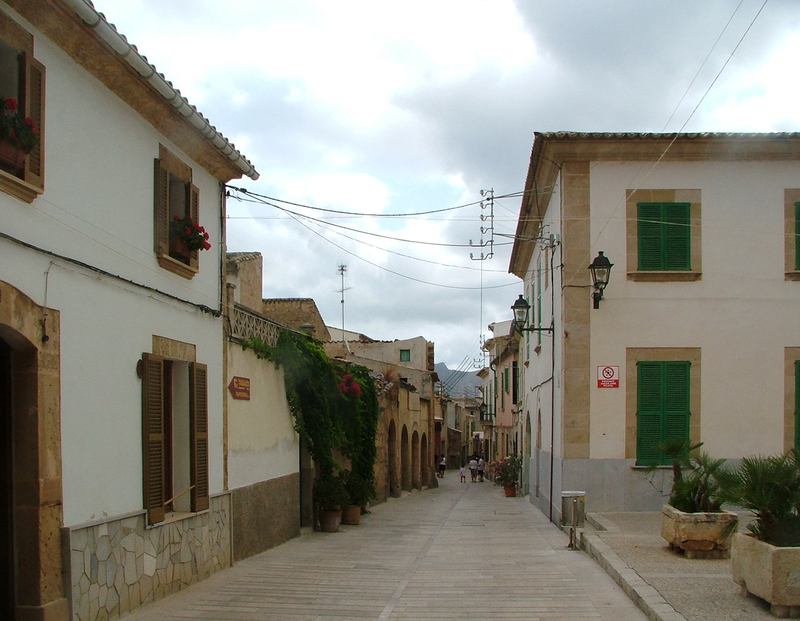 The inhabitants of Alcúdia are called "alcudiencs". Alcúdia is located in the northeast of the island of Majorca, at the foot of the peninsula of the Pinewood (Peninsula des Pinar or Peninsula de la Victòria) that separates the two large bays Pollença (Badia de Pollenca) and Alcúdia (Badia de Alcúdia). Alcúdia is part of the County of Raiguer, the town of Alcúdia is adjacent to those of Pollença in the north, and Sa Pobla and Muro south. Alcúdia is located 52 km from Palma de Mallorca. The territory of the municipality is fairly flat, except for the peninsula of Victòria and small mountains in the south, as the Puig de Sant Martí (247 m), the Puig de sa Galera (123 m) and Puig de Son Fe (268 m). In the south of the town are two ponds, located near the Puig de Sant Martí, the Estany Esperança, which was much larger in the past than now, and Estany Petit. Its port, Port d’Alcúdia, which is now a tourist destination, is located south of the city on the Bay of Alcúdia. Alcúdia is distant 56 km from Palma by the Ma-13 (about 40 minutes) motorway. The urban layout of the city of Alcúdia was marked by both speakers defensive walls around him: the first of the fourteenth century, the second of the sixteenth century. Within these speakers the streets are narrow and irregular, with the oldest houses dating from the thirteenth century and Renaissance stately windows, decorated with coats of arms. The streets of the historic center are pedestrianized. 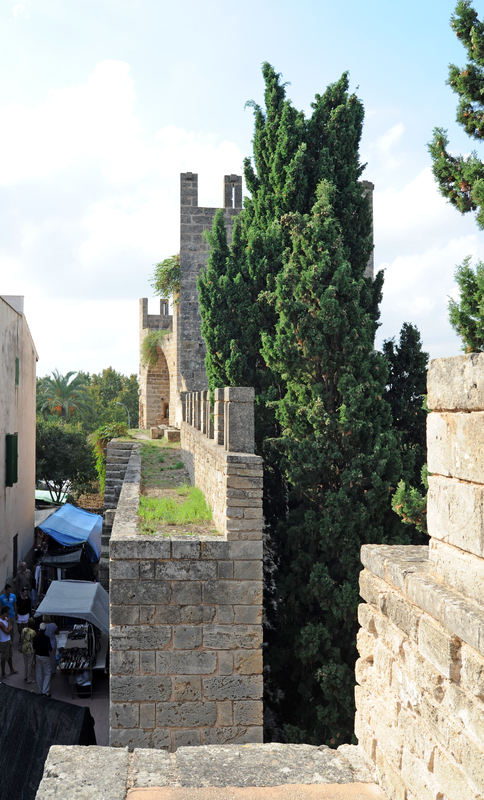 An hour or two is enough to walk in the old streets of the historic center and explore the ramparts and fortified gates. 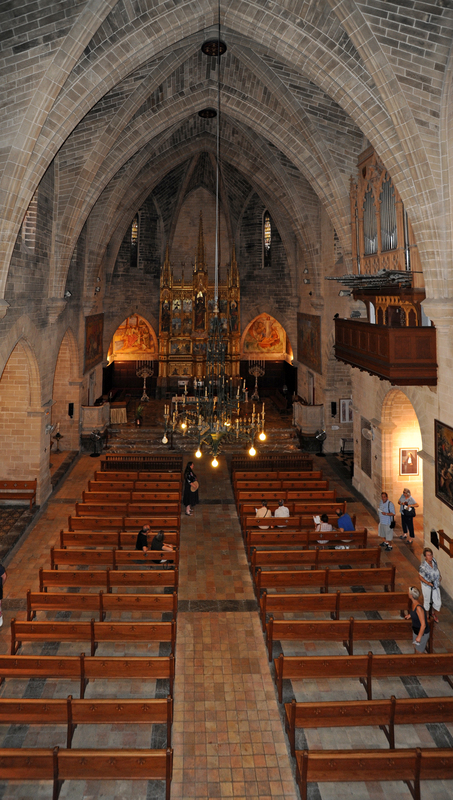 The Alcúdia parish of St. James is one of the oldest in Mallorca, and is cited in 1248 in a bull of Pope Innocent IV. 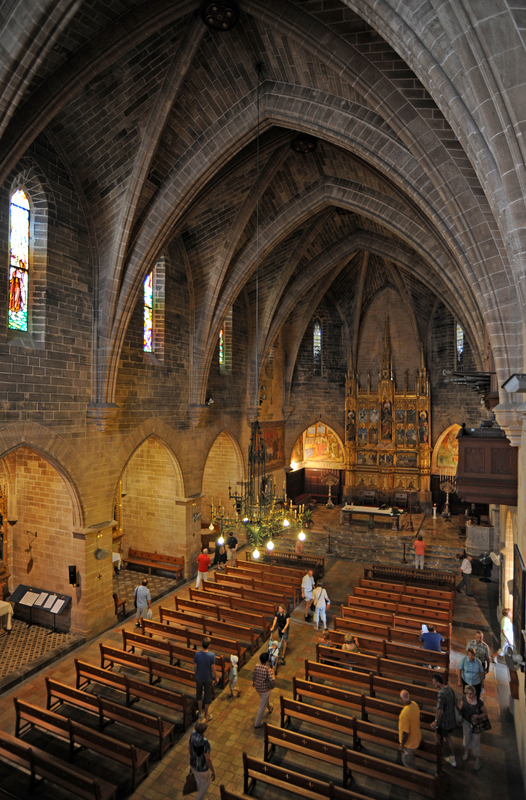 The first parish church was built, to 1302, during the reign of Jaume II. The church succeeded partially collapsed in 1870 due to its dilapidated state and torrential rains. 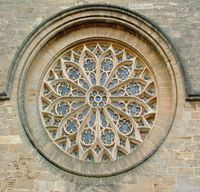 The church we see today is the result of the reconstruction of the church of St. James, in neo-Gothic style. 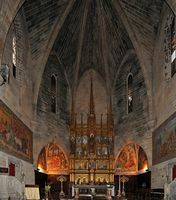 The reconstruction took place at the initiative of Father Joan Farragut, the new church of Sant Jaume was consecrated July 25, 1893 by the Bishop of Mallorca, Bishop Cervera. The main facade - west - the church of St. James is quite austere on the right stands a square bell tower, the construction of the bell tower began in 1568, commissioned by Bishop Diego de Armedo, but was stopped in 1704, the bell tower remained unfinished. 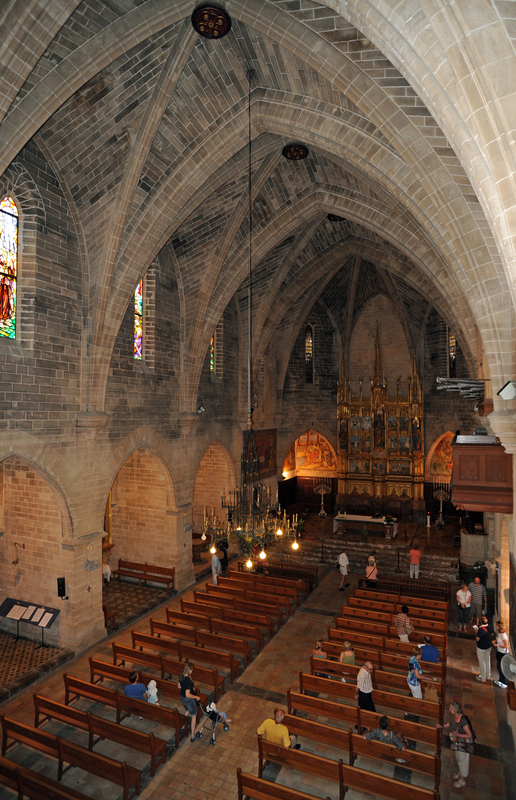 It contains four bells, one of which is the oldest bell in Mallorca, and date from 1309. The facade has a large arched gate (No. 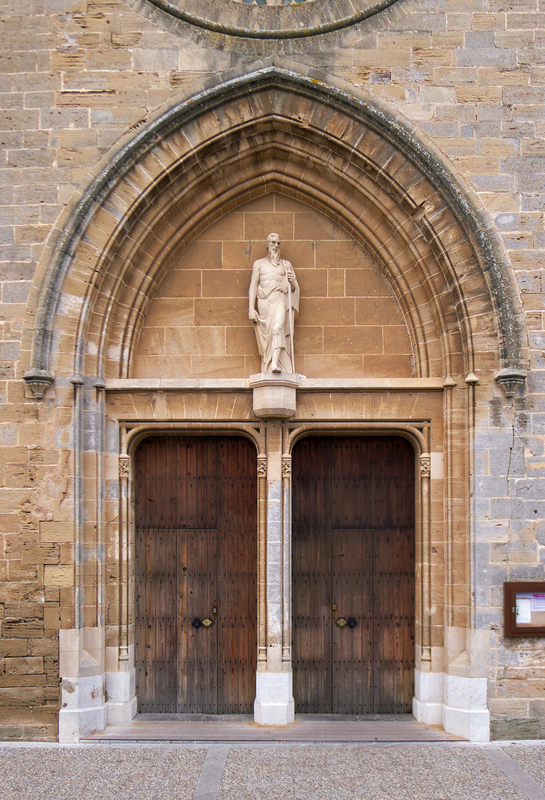 15 on the map), in the tympanum of the portal is an effigy of the saint dedicatee of the church, St. James, sculptor Remigia Caubet González (1893). 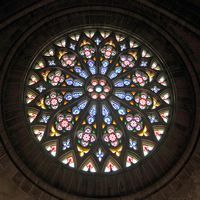 Above the portal, the frontispiece is adorned with a large rose stone with polychrome glass windows, this rose is a sculptor, a native of Alcúdia, Llorenç Ferrer Martí. 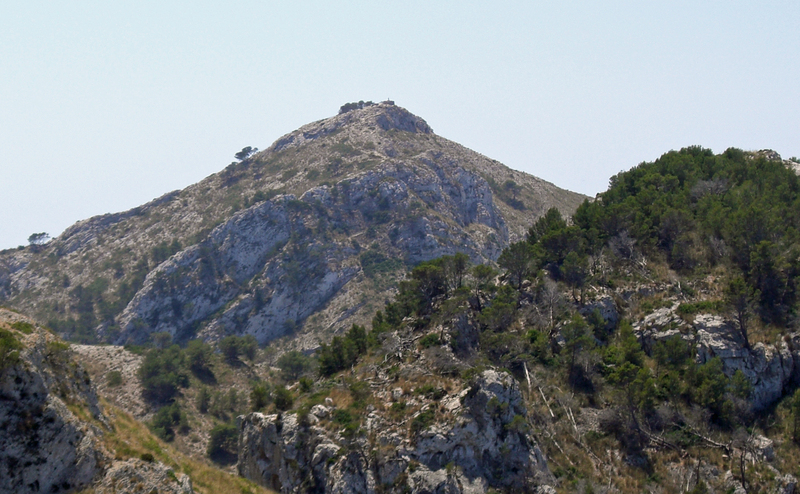 At the top is a small bell with the crest of the town of Alcúdia. Inside, above the entrance is the crest of the Farragut family, in honor of the priest, Joan Farragut (1858-1898), founder of the reconstruction of the church in the late nineteenth century. Beside the portal there is a niche where Our Lady of Victory is. The Stations of the Cross are the work of Rafael Bordoy from Alcúdia. The building is within a single nave, 37 m long by 12 m wide, with side chapels. The nave is lit by three windows. 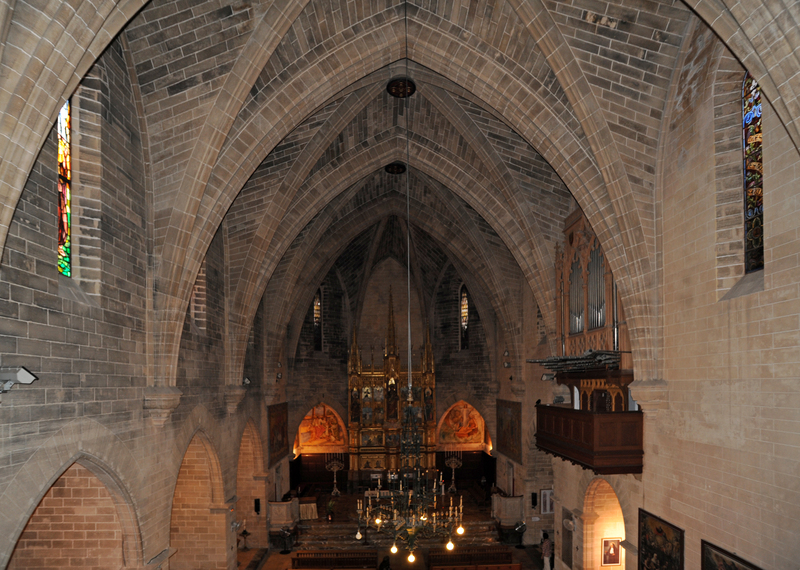 The nave is covered with a cross vault arches and is based on five key circular decorated with plant motifs: the choir is the monogram of Jesus. 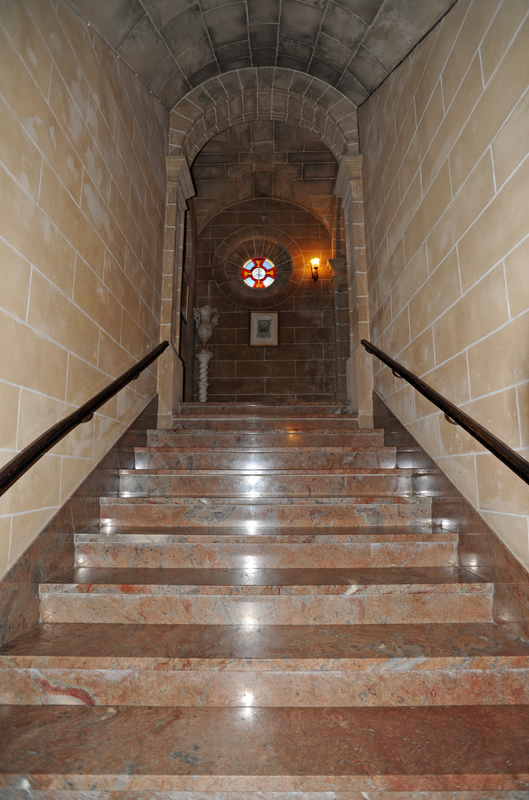 In contrast to the choir - above the main entrance - is a balcony which is accessed by two marble staircases. 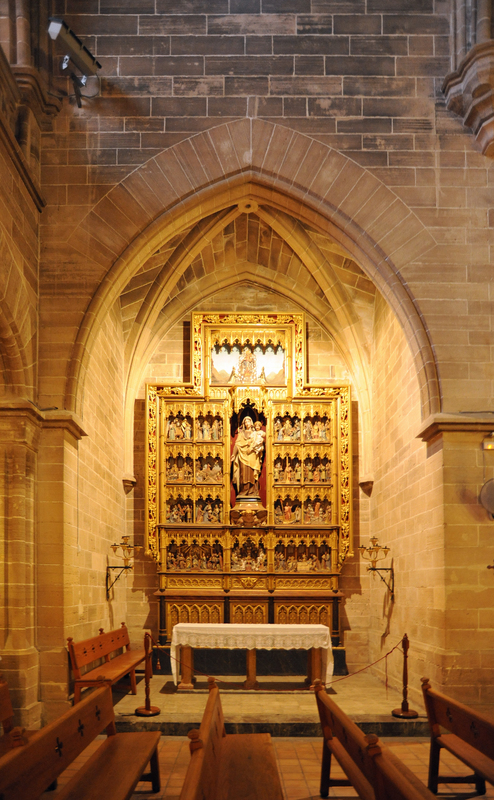 The choir (presbiteri / presbiterio) is a Gothic altar with the image of St. James in the center, and St. Peter and St. Paul on the sides, this altarpiece is a work of Llorenç Ferrer and Miquel Arcas. On the predella bas-reliefs depict biblical scenes, the four evangelists, martyrs of St. Peter and St. Paul, the keys of the Church to Peter and the appearance of St. James. In the central part, there are eight panels representing St. Catherine Thomas, the Resurrection of Jesus, the flight of the Holy Family in Egypt, the Blessed Ramon Llull, the temptations of Jesus, Jesus knocking at the door, and the Good Shepherd prayer in the Garden of Olives. 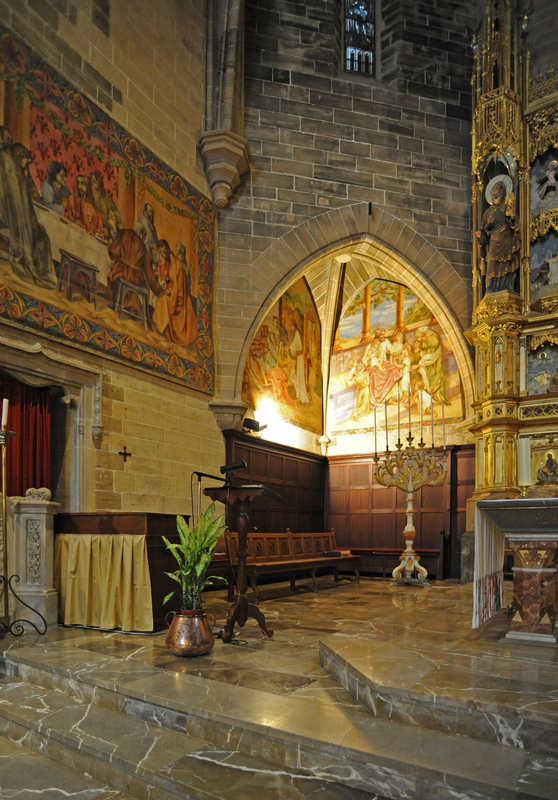 On either side of the chancel are two chairs, decorated with bas-reliefs depicting the appearance of Jesus to the Apostles and the image of the Good Shepherd. The altar table is made ​​of a single piece of stone Binissalem. 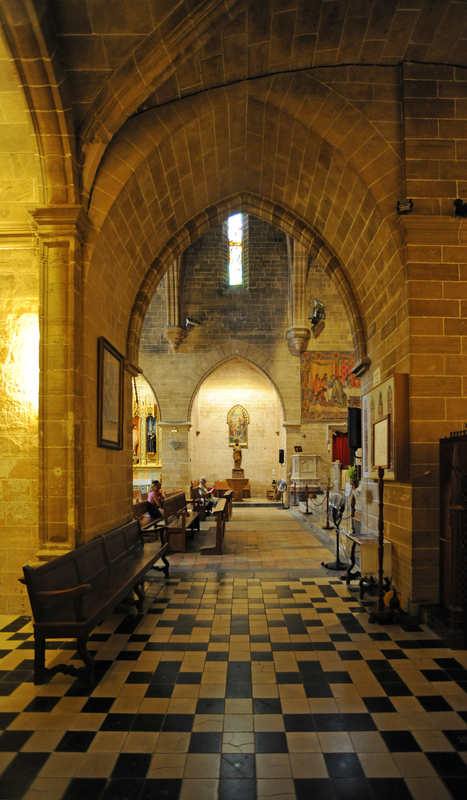 The first chapel on the left of the nave is the Chapel of St. Sebastian (Sant Sebastià) (No. 14 on the map). There is a picture of St. Sebastian, the work of Llorenç Ferrer. This chapel was once the baptistery. The second chapel on the left is the Chapel of Our Lady of Mount Carmel (Mare de Déu del Carmen) (No. 13). 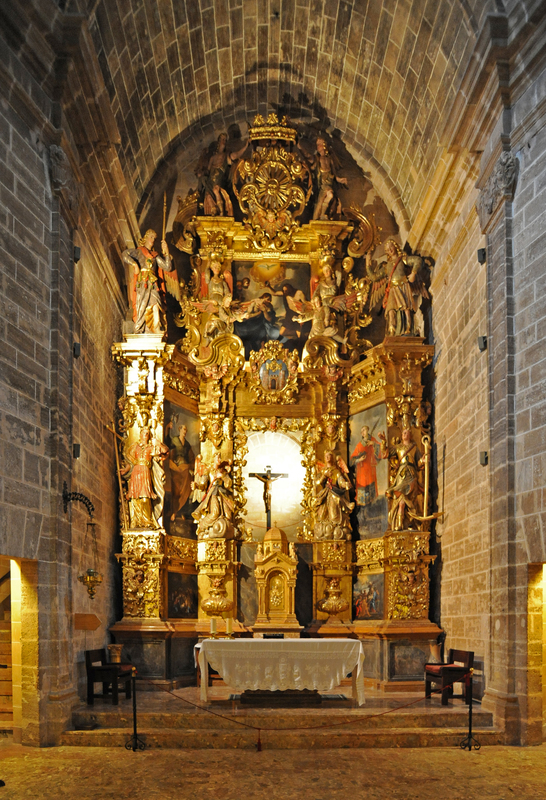 It shows a Gothic altarpiece representing the Mysteries of the Rosary and the image of the Virgin, the work of Llorenç Ferrer. 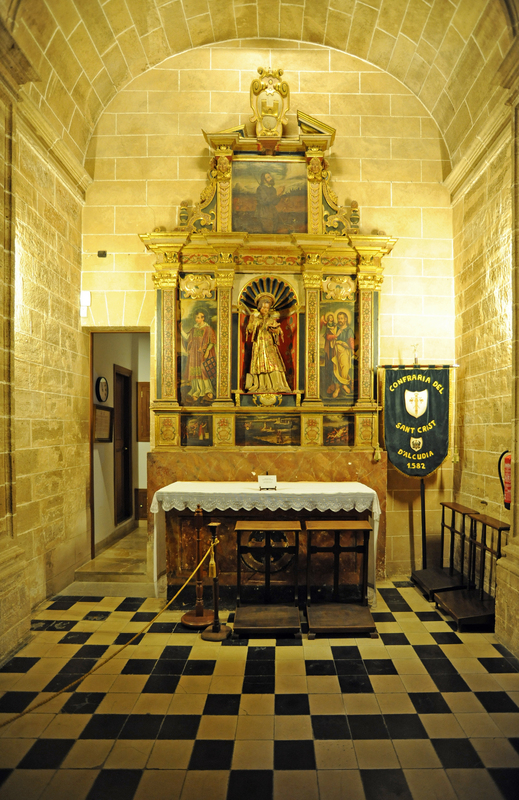 The third chapel is St. Joseph’s Chapel (Sant Josep) (No. 12). Saint Joseph is surrounded by St. Isidore and St. Anthony Abbot, by Miquel Arcas 1927. 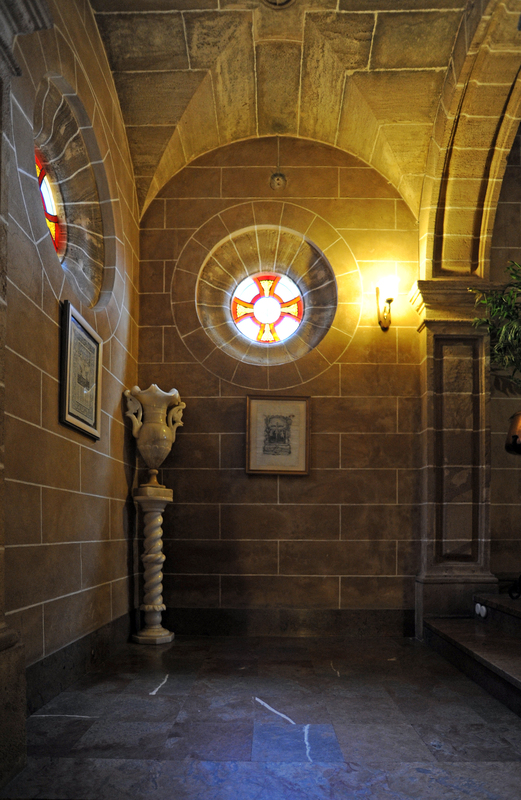 The fourth chapel is the chapel of the Sacred Heart of Jesus (Sagrat Cor de Jesús) (No. 11). On the left side is the image of St. Gemma Galgani, and on the right side, the image of St. Anthony of Padua, by Miquel Arcas in 1919. The last chapel on the left, just before the choir, is the baptismal chapel (Capella baptismal) (No. 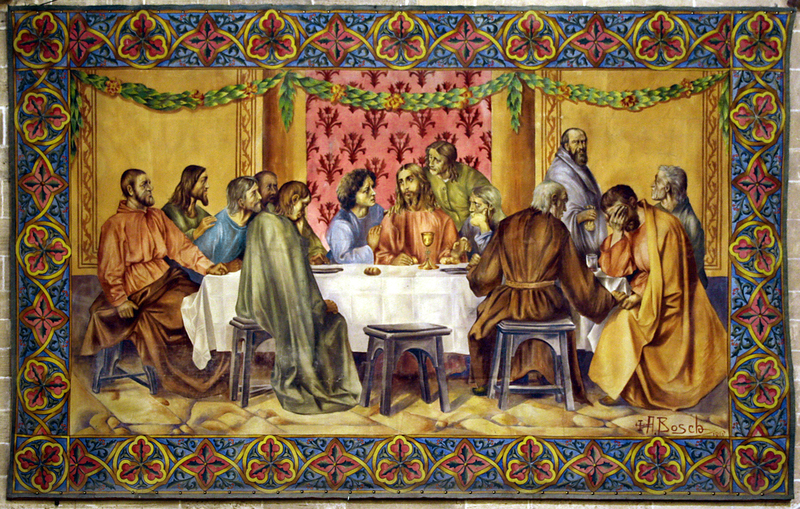 10), which contains a statue of St. John the Baptist and a painting of Jesus’ baptism. After the main entrance, on the right is the stairs to the tower. 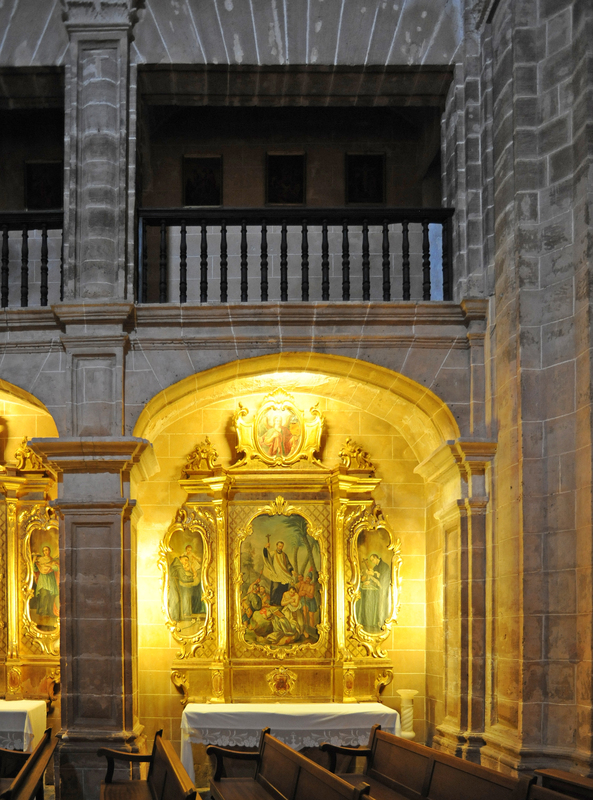 The following is the chapel Chapel of the Immaculate Conception (Inmaculada Conceptió) (No. 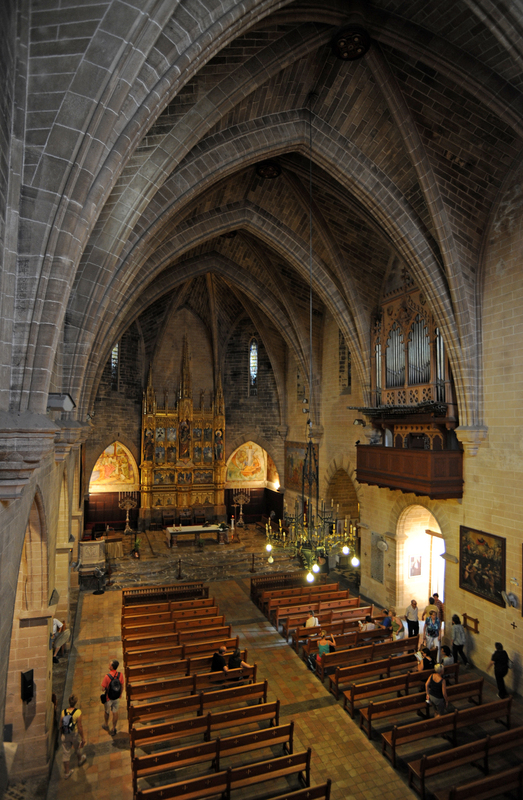 17 on the map) and it has an altarpiece by Miquel Arcas and a golden sculpture of Llorenç Ferrer acquired in 1926. 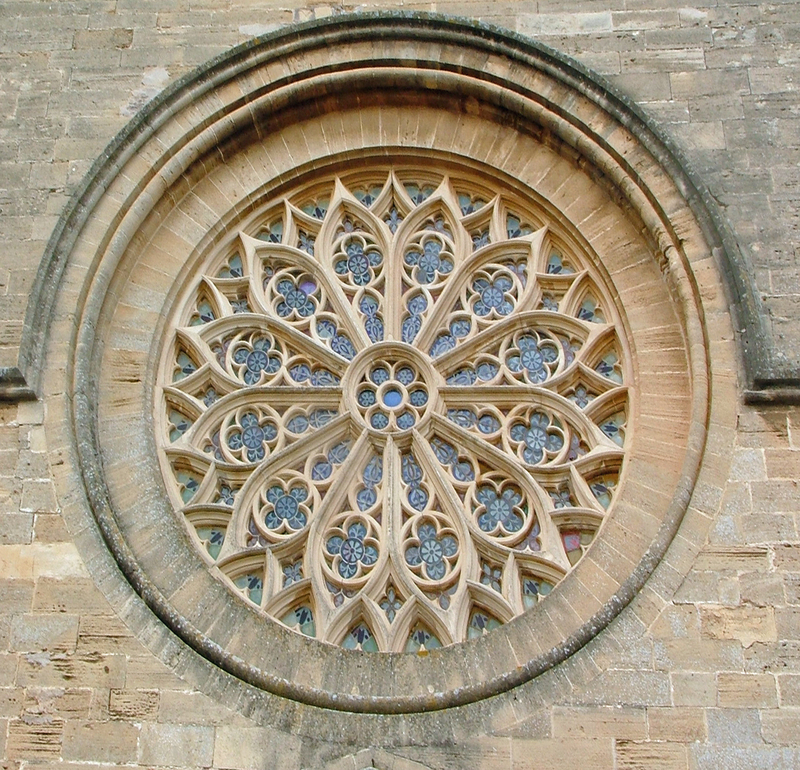 The windows on the right represent St. Rose and St. Francis of Assisi and those left are St. Catherine and the Archangel Raphael. Then meeting, on the right side portal (Portalada lateral) (No. 18), with a semicircular arch. Under the porch, there is a painting of the Nativity, a fragment of an altarpiece of the Virgin of the Rosary and a painting of St. Cecilia. 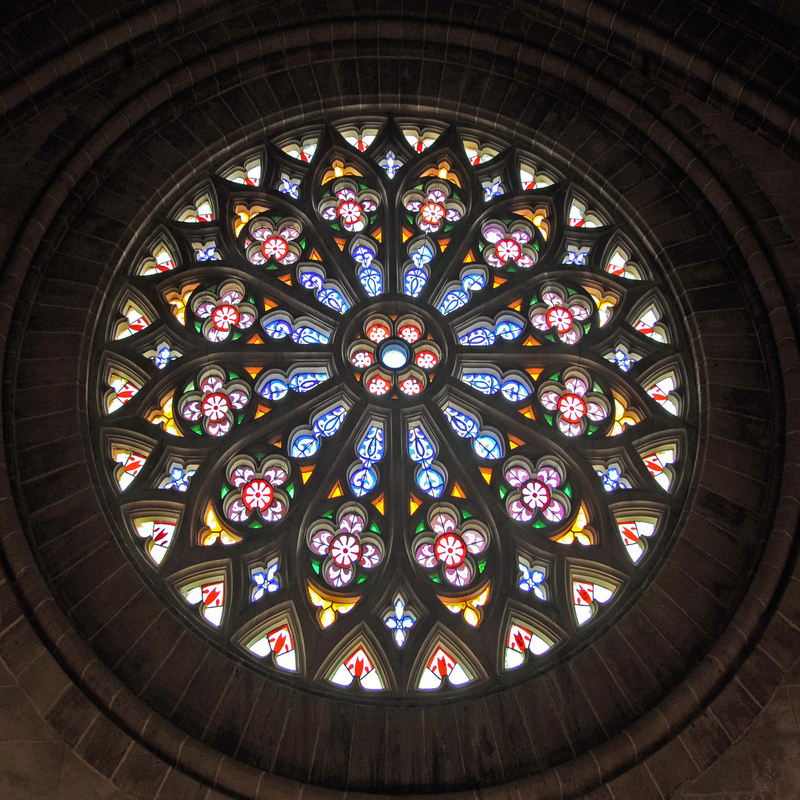 Above the side door is a small polychrome rosette Llorenç Ferrer. 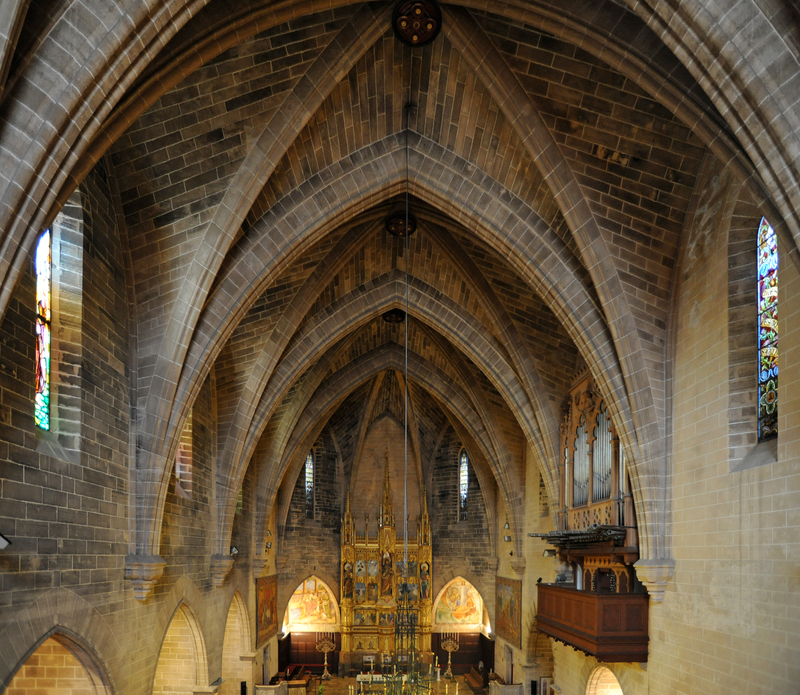 Under the arch, above the lateral portal is an organ built by Josep Barceló Runggaldier in 1893 and renovated in 1987 by deep organist Pere Reynés. The Chapel of the Holy Christ (No. 1 on the map) was built between 1675 and 1697, to venerate an effigy of Christ. The Chapel of the Holy Christ is a Baroque style, with a single nave and four bays, covered by cross arches supporting an arch crowned by a dome. 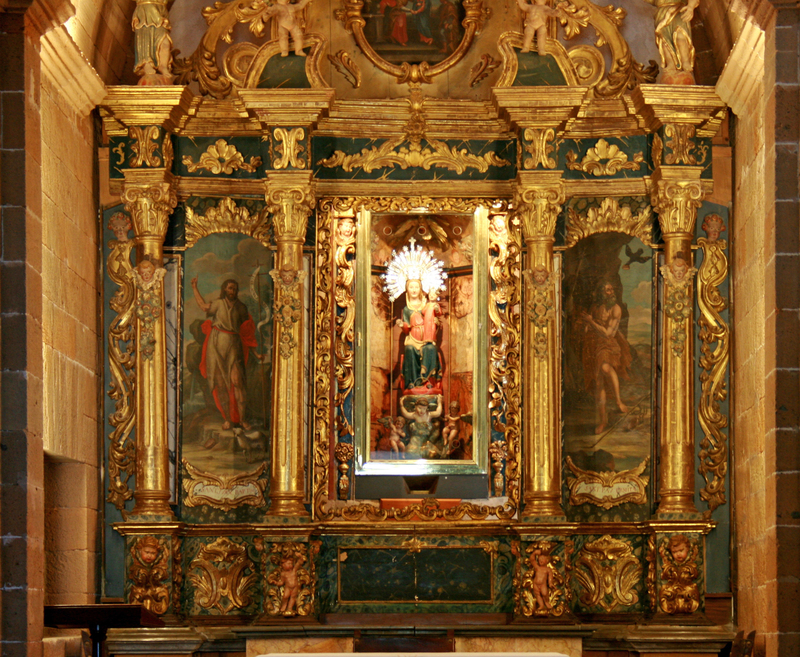 Overlooking the altar is a statue of the Holy Christ, the center of a baroque altarpiece carved by Juan Mateu i Serra in 1718. This is a polychrome sculpture of the fifteenth century. 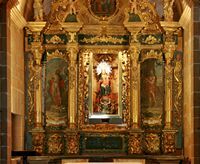 The predella of the altarpiece is formed by the tabernacle, in the center, surrounded on each side by paintings depicting the Birth of Jesus and Adoration of the Kings. In the center is a Christ Crucified and paintings of St. Matthew, left, and St. Stephen, right. Two sculptural allegories on the extreme side, Faith, left, and Hope, right, above the crucifix is ​​the emblem of the city. On the upper, middle, include the baptism of Jesus with all around him, kneeling angels, on the sides you can see the allegorical representations of Charity (left) and Good Works (right). It all ends with a large golden sun above which sustained by two angels crown rests. A pious legend says that the statue of the Holy Christ would have sweated blood and water in 1507, putting an end to a period of drought. Since that date in 1507, a three-year procession (2010, 2013, 2016…) takes place: the population is slowly for several hours, bare feet and silently through the city to the chapel. 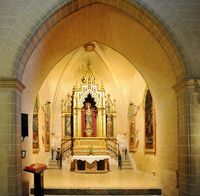 To the right of the chapel, just below the choir, is the altarpiece of the Virgin of Sorrows, which comes from the old Franciscan monastery of Alcúdia. In the center you can see the Descent from the Cross, Our Lady of Sorrows, and on each side, the paintings of St. Paul (left) and St. Paul the Hermit (right). On the predella is represented the death of St. John, the Descent from the Cross with the three Maries and the celebration of a Franciscan office. On top of the altar one can distinguish the Holy Spirit giving the gospel to the Archangel Gabriel, the image of St. John in combat and the Virgin Mary. To the left of the chapel is the altar of St. Vincent Martyr. We know neither the date nor the author, but we know it existed in 1563. To the left there is a painting of St. Lawrence Martyr, and to its right St. Joseph and the Child Jesus. On the predella are represented several scenes of martyrdom. The small chapel St. Anne is located south of the city walls on Cemetery Road (Carretera Cementiri). 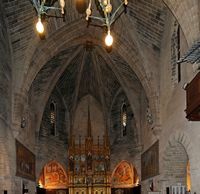 It is a building of the thirteenth century, built by the first settlers Catalan leveraging materials from the ruins of the Roman city of Pollentia, which is one of the oldest churches in Mallorca. Above the entrance was a statue of Our Lady of the Good News (Verge de Bona Nova). 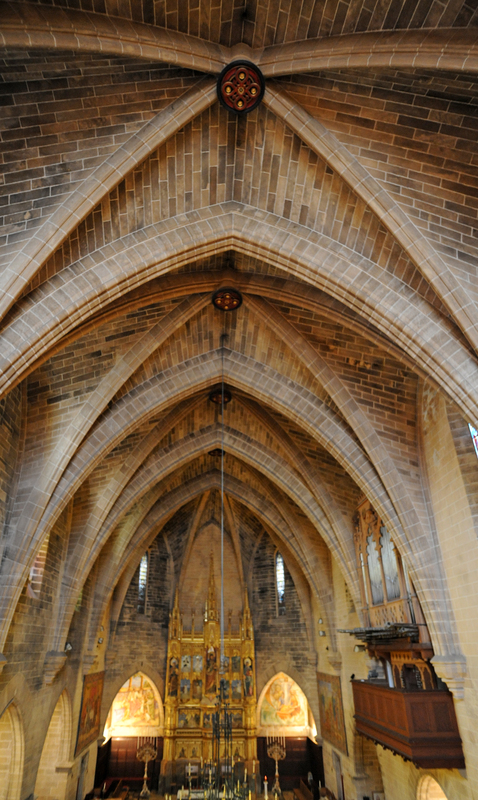 The small nave is divided into four sections by three arches. Outside the walls of Alcúdia, in front of the church of St. James, is the remains of the Roman city of Pollentia. 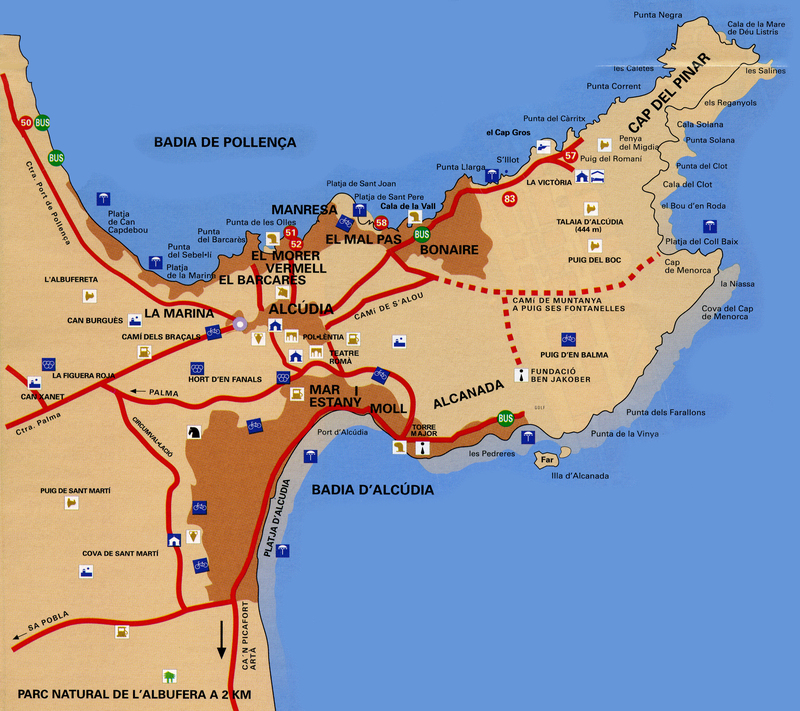 Pollentia was the Roman capital of the Balearic Islands in the first century BC to the third century AD. 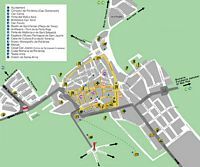 The site includes a residential area (Sa Portella), a small Roman theater and forum, where you can see the remains of a Capitol dedicated to Jupiter, Juno and Minerva, and the remains of two smaller temples. Go to the archaeological site of Pollentia. Alcúdia guard access to the Victòria peninsula separating the Bay of Pollença Bay of Alcúdia. To defend this strategic place, the construction of fortifications was ordered by the king of Majorca Jaume II, at the end of the thirteenth century (1292) - shortly after the Reconquista - to protect Alcúdia raids Muslim pirates. The construction of these walls, rectangular plan, 1, 5 km long and 6 m high and having 26 rounds, asked more than 60 years during the first half of the fourteenth century, and will be completed during the reign Peter IV of Aragon, said Ceremonioso, to 1362. The walls were pierced by two doors: the door or door Mallorca San Sebastian (Porta de Sant Sebastià / Puerta de San Sebastián) and Mill Gate (Porta del Moll / Puerta del Muelle) or Xara Gate (Porta Xara), which opens onto the rue du Port. The fortifications were strengthened in the sixteenth century under Philip II of Spain, and a second belt of walls with bastions (Xara, Vila Rotja and Església), was built on a star-shaped plan that surrounded the ancient walls. The fortress of Sant Ferran in which was installed later the Plaza de Toros was retained. A third door was created, the door Vila Roja, which opened on a stone bridge still visible. The defenses were further revised in the seventeenth century during the reign of King Philip IV (Felipe IV) in 1660. 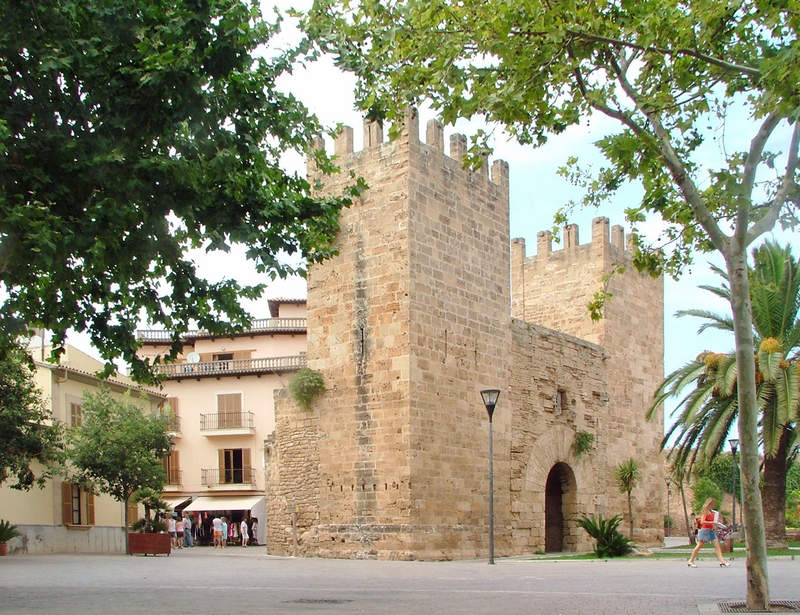 The walls of Alcúdia were largely demolished by order of the municipality in 1940. What remained of the old fortifications has been a recent recovery aspect a little artificial. 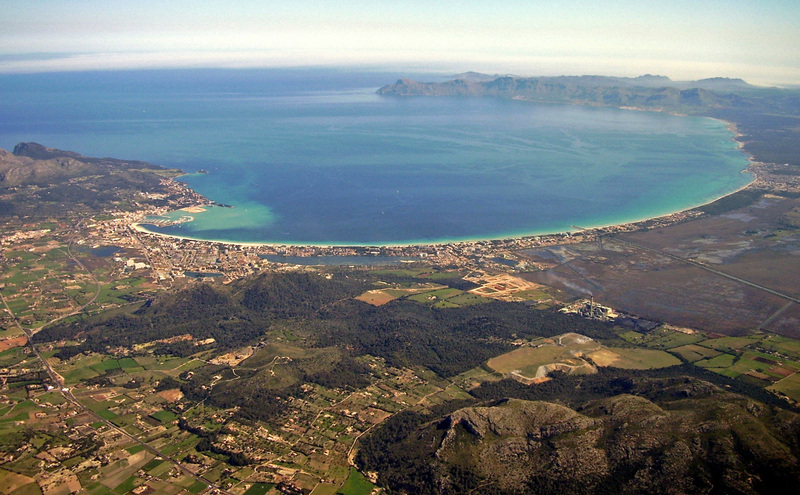 The peninsula of the Victòria separates the bay of Alcúdia Bay from the bay of Pollença, which is a rocky peninsula which culminates in Puig de la Victòria to 445 m, also called Sa Talaia d’Alcúdia, the secondary peaks are Puig des Romaní (the "Mount of Rosemary") (387 m) Penya Rotja (354 m) and Sa Talaia Vella (349 m). At the top of the mountain Penya Rotja (the "Red Mountain"), also known as Penya del Migdia, is an old watchtower (talaia) built in 1603. This watchtower was abandoned and replaced by de Sa Talaia d’Alcúdia, the highest tower in Majorca watch. Penya Rotja tower was restored in the early twenty-first century, we can still see the old cannon. 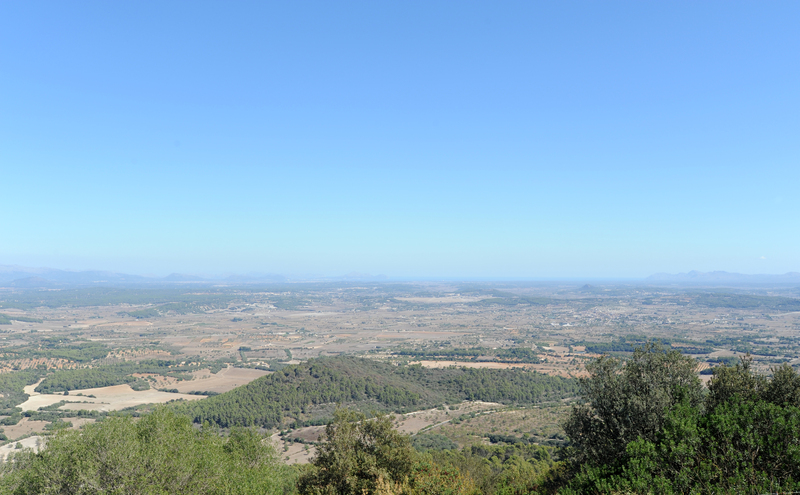 The area around the Puig de la Victòria is a protected area, an area of about 1200 ha, including pine forests and scrublands, with wild olive trees, rosemary, heather (ciprell) of palmettos (garballó) and some date palms. The fauna includes many seabirds like gulls and cormorants, including ospreys nesting in the protected area, there are also some species of hawks. 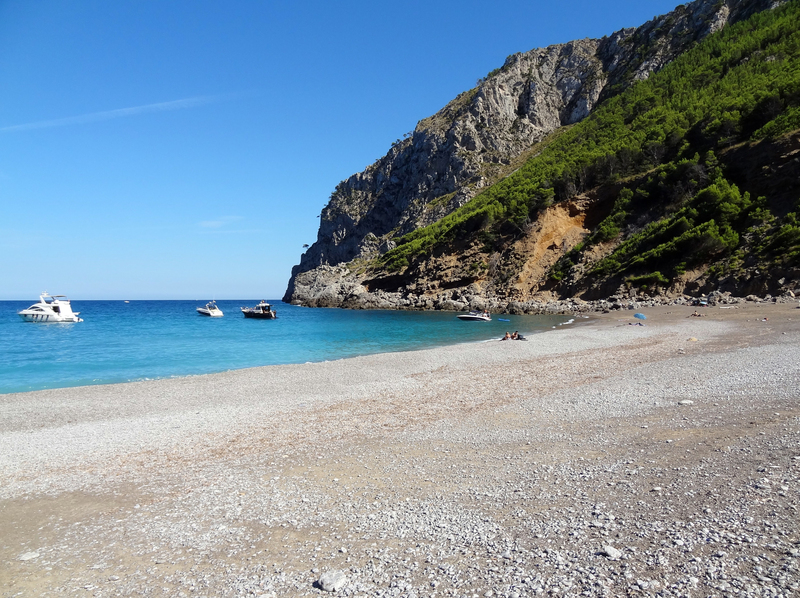 The coastline of the peninsula is very rocky, and the south-east coast - in Alcúdia Bay - has a pebble beach but nice Sa Platja des Coll Baix, accessible by a carriage and walking path; of tour boats also commute. The north-west coast - Bay of Pollença - includes many cliffs and some small beaches such as S’Illot, and a beautiful rocky area with many shallow coves, the Punta de Manresa. After passing through the suburbs of Es Mal Pas and Bonaire, the coastal road reaches - 600 m after S’Illot - a small road that goes on the right, to the hermitage of the Victòria ; coastal road continues - in a spectacular environment - towards Cap des Pinar but unfortunately the course is a closed military zone. 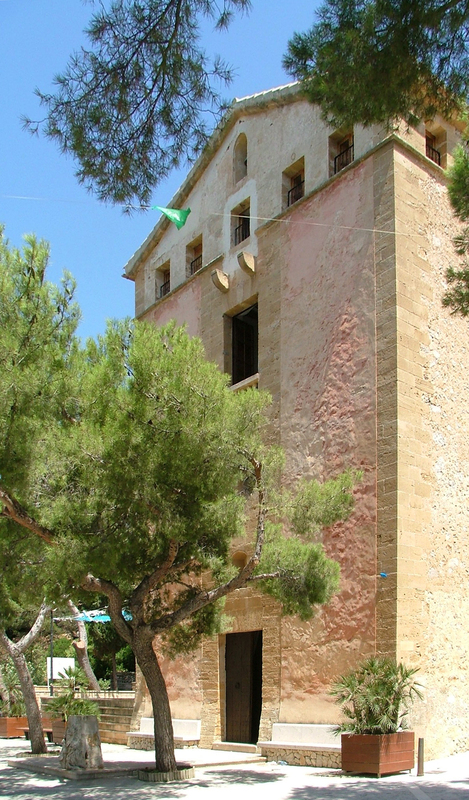 The fortified church of the hermitage of Mare de Déu de la Victòria stands on a high eminence of 140 m, on the peninsula of Victòria, about 7 km from Alcúdia. Continuing, we reached the Penya Migdia (315 m) and the top of Sa Talaia d’Alcúdia (445 m) with a view overlooking the two bays of Alcúdia and Pollensa and Formentor headland, north. The chapel houses the Virgin of Victory, a sculpture in wood, 69 cm tall, Gothic, dating from the fifteenth century. Its name comes from a victory in 1551 by the inhabitants of Alcúdia on the Turkish pirates during one of the many battles that took place in the sixteenth century. 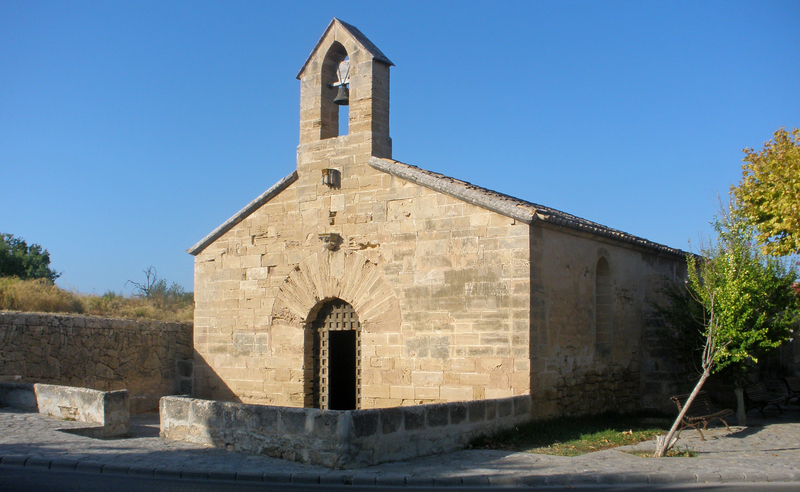 The construction of the hermitage of the Victòria dates from the thirteenth century, in 1697, the church was rebuilt in the Baroque style, with semicircular arches. 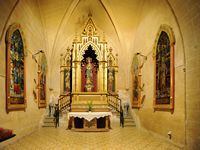 Mare de Déu de la Victòria is the patron saint of the town of Alcúdia, the chapel is a place of pilgrimage on July 2 of each year. 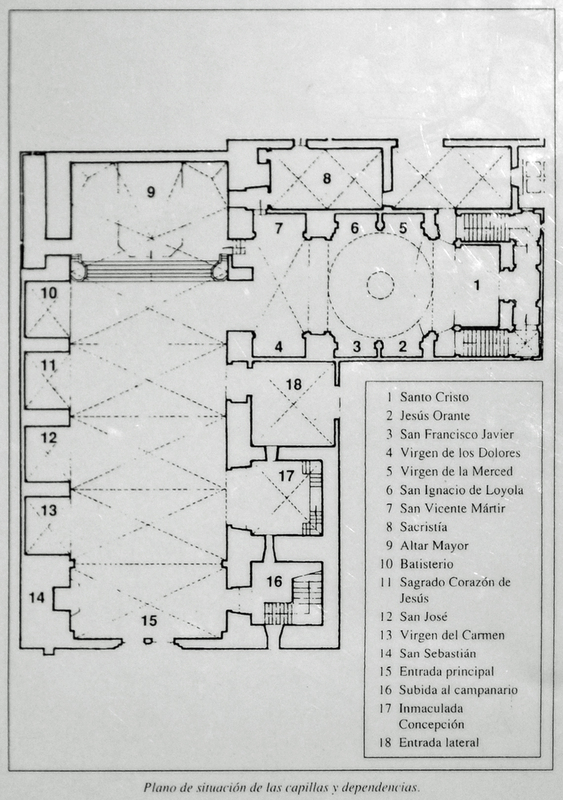 The building includes the church, located on the ground floor, and a guest house with 12 rooms, which occupies the top two floors which originally were only accessible from the inside. The guest house has a pretty good restaurant. Since the Hermitage, a tour of 40 minutes can climb to the top of Puig de la Victòria (Sa Talaia d’Alcúdia), where a watchtower. Cave Sant Martí is a natural cave at the foot of the southern slopes of the Mount St. Martin (Puig de Sant Martí) (247 m) southwest of Alcúdia. This cave was used as a place of worship in the early Christian period. 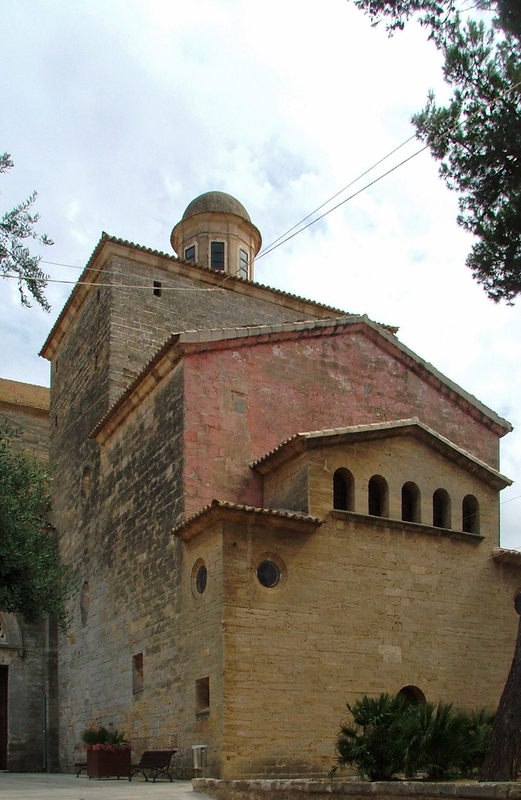 After the conquest of Mallorca by the Crown of Aragon two Gothic chapels were built in the thirteenth and fourteenth centuries, in the main part of the cave: the chapel St. Martin (Sant Martí) and St. George (Sant Jordi). It can be accessed by a staircase carved into the rock. The cave is home to two protected species of bats. Sandy beaches extend southeast 10 km long, the towns of Alcúdia and Muro, up Can Picafort, the nearest town is the Platja d’Alcúdia in Port d’Alcúdia and Platja de Muro. To the north of the bay of Pollença there is the Platja de Sa Marina, the Platja de Sant Joan and Platja de Sant Pere, near residential neighborhoods Mal Pas and Bonaire on the peninsula of Victòria, there also some coves like Cala de S’Illot and Cala d’Es Clot ideal for diving. To the east, on the south coast of the peninsula of Victòria, there are creeks and Alcanada Coll Baix. A distinctive episode in the history of Alcúdia was the revolt in which Alcúdia Germanies was the only city to remain faithful to the crown, the Germanies were brotherhoods of peasants and artisans united against the power of the nobles and high taxes and they went master of Mallorca for over a year, from 1521 to March 1523. After the massacre perpetrated by the noble "agermanats" (members of the Germanies - from germà, brother in Catalan - or Germanías in Castilian Spanish) at Bellver Castle in Palma, the survivors took refuge in the walled town of Alcúdia. 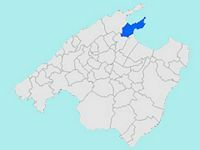 In November 1521, then in 1522, Alcúdia was besieged by the rebels headed by a hat manufacturer, Joanot Colom. In August 1522, Carlos I of Spain, later Charles V, had landed 800 men to resume Alcúdia Majorca. March 8, 1523, the capital still held by the rebels surrendered. 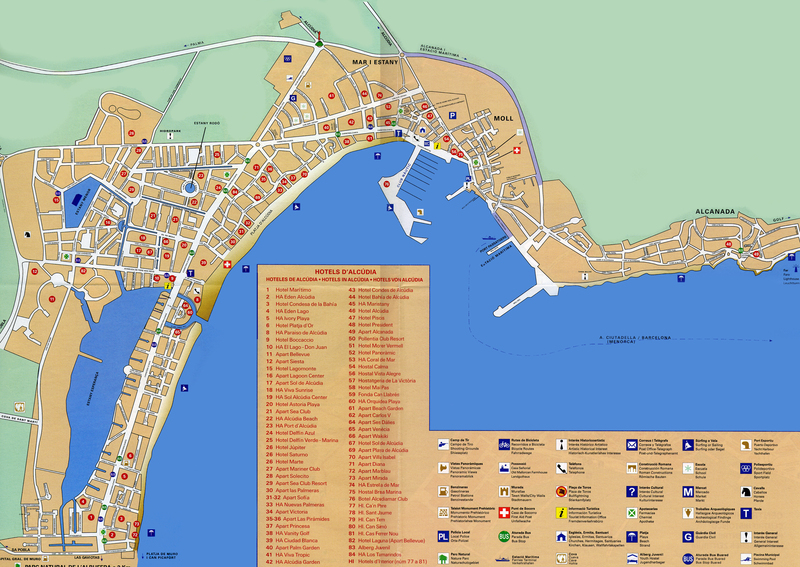 July 18, 1523, as a reward for his loyalty, the Emperor Charles V granted the title of Alcúdia "Ciutat fidelissima" and tax exemptions that were the cause of a series of disputes with the authorities in Mallorca who opposed. Alcúdia town: Carrer Major, 17. Open all year. Port d’Alcúdia: Passeig Maritim, s / n. Open from April to October. The market is held on Sundays and Tuesdays, in the old town of Alcúdia: Carrer Major, Carrer Moll, Passeig Mare de Déu de la Victòria and Passeig Pere Ventayol.